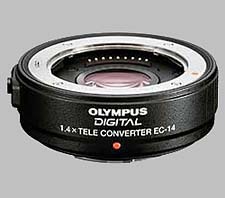 (From company literature) When you need more telephoto in a smaller package, the EC-14 1.4x Teleconverter is an ideal choice. With only 1 stop of light loss the 1.4x converter still provides a fast super telephoto for sports and nature photography. Turn your Zuiko Digital 300mm f/2.8 into a 420mm f/4.0 (35mm equivalent 840mm f/4.0). The EC-14 is compatible with the Zuiko Digital 14-54mm f/2.8-3.5, 50-200mm f/2.8-3.5, 300mm f/2.8, and 50mm f/2.0 (f/2.8 and up) lenses and is fully multi-coated to retain the high lens performance you expect. An inexpensive solution for professional-level results. Invisible! Essentially no image degradation at all! This is the first 1.4x teleconverter that I've used, of which I could see no discernible effect on the quality of the output. I use it a lot with the wonderful 35-100mm /2. Performance is stellar. really nothing to complain at all.